This post is focused on NSX-V (NSX for vSphere) which from this point forward I’ll refer to as NSX. Future posts will cover NSX-T components and architecture. 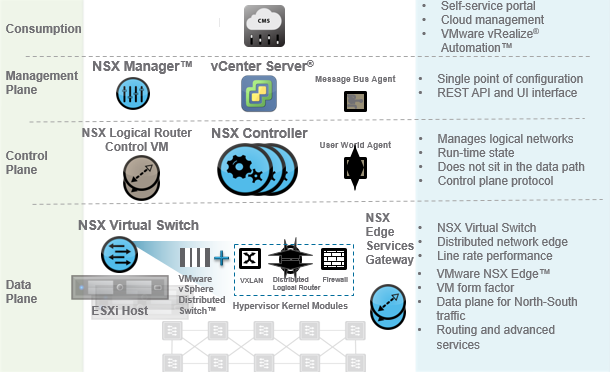 The graphic below shows the major components that make up NSX and in this post I’ll cover some of the features and functionality at a high level. As the name suggests, this provides the centralised management functionality to the NSX environment. NSX Manager is deployed from an ova file and has a simple wizard to configure the appliance. In a future post I will detail the steps involved. Some other responsibilities that NSX Manager has are listed below. Maintains VTEP, MAC and ARP tables. This is also referred to as the DLR Control VM and is another control plane component. The primary purpose is to establish OSPF and BGP neighbours (peers) and provide routing updates to the NSX Controller cluster. This is deployed from NSX Manager as a virtual appliance and can be configured in an active-standby mode for high availability. The vsfwd service interacts with with NSX Manager to retrieve distributed firewall policy rules and also sends back statistics and audit logs. VMware NSX requires the vSphere environment to run the vSphere Distributed Switch (vDS) which is usually only found with Enterprise Plus licensing. Don’t worry if you have another edition of vSphere licensing as when you purchase NSX you are entitled to the vDS. The NSX Virtual switch is the combination of the vDS and kernel modules to provide extra functionality such as VXLAN, DLR and DFW. The NSX Edge can provide common network services such as DHCP, VPN, NAT routing, load balancing and perimeter firewall. Edge appliances are deployed from NSX manager as virtual appliances and depending on the workload requirements there are 4 profiles available and these can be changed post deployment if required. ECMP is supported for up to 8 paths. I hope this post has given you a high-level insight to some of the components that make up NSX and what functionality or features they provide. In future posts I plan to cover some of these areas in more depth so make sure you stay tuned.